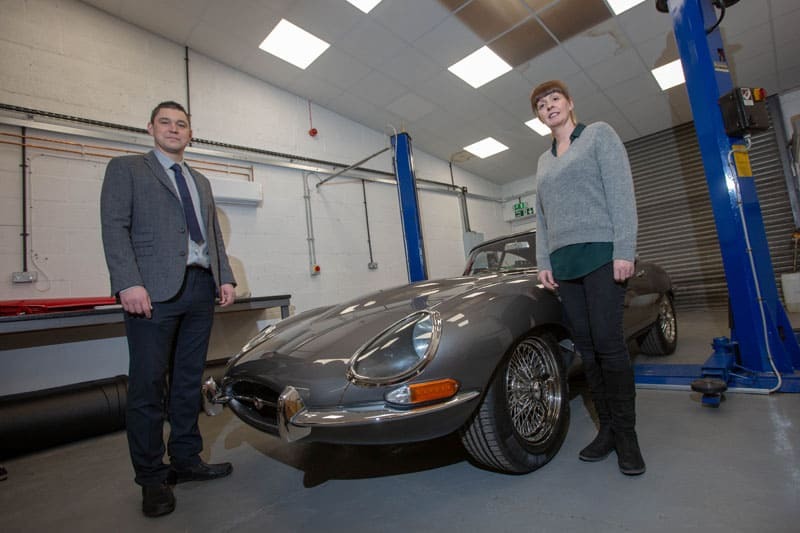 An Aycliffe Business Park-based firm which specialises in air compressors and blowers has supplied a “vital” air compression system to Evolution E-Types, a company in Darlington which specialises in the manufacture of an E-Type for the 21st century. 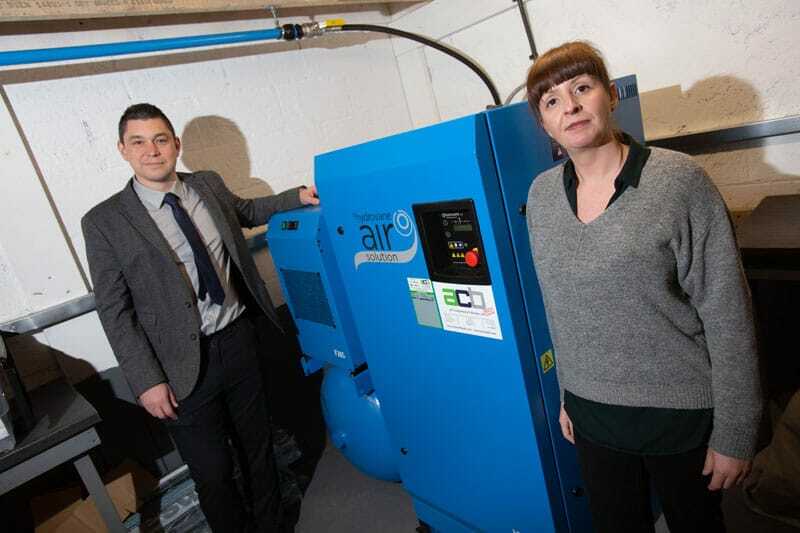 A cold call to Evolution E-Types following a October 2017 move from Gateshead to new premises on Aycliffe Business Park led to Air Compressors and Blowers (ACB) sealing the deal, worth just under £25,000. ACB is part of the TFG group of companies with a head office in Sheffield and is motoring along nicely at the moment as it remains on course for a fifth consecutive year of year-on-year growth. Part of the British Compressed Air Society, it is the only authorised distributor of Gardner Denver products in the North East and has more than 300 clients, 72% of which are in the DL, DH and TS postcodes but also span from the Scottish Borders down to Wetherby and across to Cumbria. It also distributes Hydrovane, Reavell and Elmo Rietschle compressed air and vacuum equipment, and has installed two Hydrovane air compressors – HV 15 and HR 07 models – at Evolution E-Types’ premises at Alliance Business Park in Darlington which includes a lathe shop, workshop, and paint and machining areas. Founded by managing director Uryk Dmyterko 25 years ago, Evolution E-Types restore and ‘evolutionise’ immaculate and bespoke versions of the E-Type, retaining the iconic Sixties classic’s luxurious original integrity while adding their own touches and parts for a superior modern-day driving experience. And both firms are blown away by the deal’s outcome, with air compression essential to the Evolution E-Types creative process. 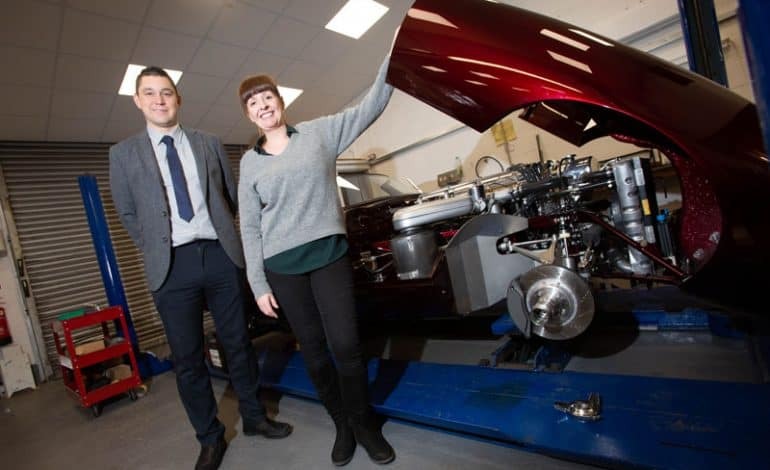 ACB Group sales director Paul Sparke (pictured with Evolution E-Types’ business development manager Hayley Campbell) said: “I’m not actually the biggest car fan – I’ll sit and watch Top Gear – but you can’t help but be impressed by what Evolution E-Types do. Paul Sparke from Air Compressors and Blowers with Hayley Campbell, businesses development manager at Evolution E-Types. Explaining the installation and its importance to a business like Evolution E-Types, Sparke said: “Without compressed air you can’t run a place like this, so it gets called the fourth utility after your water, gas and electricity. “It was more labour-intensive to do than anything,” he added. “The design was based on what they had, what they were using, and just from experience I knew what size to supply but also give them a little bit of a buffer for the future. “Their unit was slightly different to the others that we do, because normally the distribution pipework we do we would normally put on a ring main. “So when we did the design we had to take into consideration the calculation and make sure the pipework was sized correctly taking into account distance and pressure drop, which we calculated out. “So over the office-side units the pipework which they could have got away with is 25mm if it was on a ring, but we have actually put 40mm in there for any defects or pressure drop, or any expansion plans. “It’s the same on the opposite units. We could have got away with a slightly smaller compressor but we went with the next size because they were looking at expanding, so we took that into consideration and went for the next model up. “But the machines themselves, all our engineers are factory-trained, and the Hydrovane is still built in Britain down in Redditch. Evolution E-Types cater for affluent clients and classic car collectors mainly based in the London and Essex areas, with prices starting from £395,000 as they fit everything from leather interiors down to the finest details such as their own manufactured nuts and bolts. Hayley Campbell said: “Before the air compressing system was installed every unit maybe had an air compressor of its own, or there was one every two or three units. “And they had got to a lifespan where they were breaking down and it was difficult to get parts replaced. “We had always had a vision that we wanted one system on either side where we would feed the whole plant and any jobs that we had ongoing. 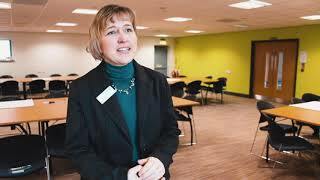 “ACB have always been professional and know what they are talking about. “They have done plenty of site visits to make sure the job’s done right first-time and ironed out any issues. And they are always at the other end of the phone, which is good. With an ever-growing number of customers such as Evolution E-Types and their new timed air compression system which cuts out noise pollution, Sparke says ACB’s future is bright. “It’s definitely been worthwhile moving to Aycliffe,” he added.